When you picture the cool girl from your high school, she’s probably wearing Abercrombie jeans, and she’s probably brandishing a Starbucks cup as an accessory. Now revise that image for 2018: she’s wearing Snapchat glasses and she’s holding a Chick-fil-A sandwich. A new survey declared that Chick-fil-A has finally dethroned Starbucks as the favored restaurant among American teens, so Frappuccinos are officially out. The semi-annual survey collected interview data on spending habits from 8,600 teens at an average age of 16, split across three separate income sectors. Researchers concluded that 24% of their spending was going to food, surpassing clothing and other lifestyle expenses (concert tickets, selfie sticks, drugs) -- so at present, teens are either hungrier, or they all have viral food Instagrams. After Chick-fil-A and Starbucks, the youth are pouring their limited funds into McDonalds, Chipotle, and Taco Bell -- major fast-casual franchises with serious national reach. They’re generally inexpensive, they’re widely available, and they serve food that tastes good in a bad-for-you sort of way. Researchers speculate that Starbucks’ decline in status may have something to do with a cultural aversion to dairy or caffeine, though one imagines the health concerns wrapped up in a fried chicken sandwich are equally debilitating. Still, the exact causes of the coffee-purveyor’s fall from grace remain mysterious. Starbucks, once the tried and true mark of chill, is no longer king. 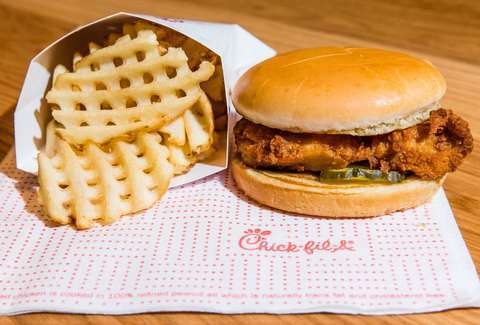 And apparently, chicken sandwiches and waffle fries are the new PSL. All hail Chick-fil-A.